it's discrimination plain and simple." René Redwood was Special Assistant to the Secretary of Labor, Robert Reich (during the Clinton administration). She was executive director for the Glass Ceiling Commission and Greenberg-Lake: The Analysis Group, a political consulting firm. This article is excerpted from a speech given at the "Working Women's Summit" held by Women in Technology International (WITI) in Philadelphia, Pennsylvania in September 1996. Amidst the fierce national debate now raging about the role of minorities and women in the workforce, the reports of the Federal Glass Ceiling Commission have added fuel to the fire. Daily reports on the review and examination of programs and policies that help all achieve their fair share of the American dream permeate the airwaves and journals. The work of the Glass Ceiling Commission cannot be separated from the ongoing public discourse about affirmative action, equal opportunity, and diversity. We are in motion, and the world has changed. This new era of economic dynamism and possibility marks the end of the old era of stable mass production. We have moved from the farm to the assembly line, and are en route from the assembly line to the computer. Information technologies, combined with global trade and worldwide investment, have shifted the economic ground we stand on. Decades of hard won civil rights gains are now being threatened; public policies are being scrutinized under ever stricter legal microscopes, and an atmosphere of unease about the future pervades our national consciousness --a future beset with economic challenges from abroad, technological innovation at home, a demographic revolution in our work force and a re-stratification of society, which Secretary of Labor and chair of the Glass Ceiling Commission Robert Reich has characterized as "the revolt of the anxious class." We do not yet live in a color blind or gender blind society. Sexism, racism, and xenophobia live side-by-side with unemployment, underemployment and poverty; they feed on one another and perpetuate a cycle of unfulfilled aspirations among women and people of color. Do not get sidetracked by semantics. For people confronting these barriers, it's discrimination plain and simple. The glass ceiling is one manifestation of the perpetual struggle for equal access and equal opportunity. Glass ceilings are the artificial barriers that deny women and minorities the opportunity to advance within their careers. Many of you have confronted your own glass ceiling barriers, from the shop floor to the executive door, long before the Wall Street Journal highlighted the problem in March 1986. The fact finding report, Good for Business: Making Full Use of the Nation's Human Capital highlighted some of the most telling data. Simply put, surveys of the top Fortune 1000 industrial and 500 service companies show that 95 percent of senior level managers are men and of that 95 percent, 97 percent are white. And of the five percent of these managers who are women, only 5 percent are minority women. That translates into slightly more than 2100 senior women executives in these companies -- far too few in proportion to their numbers in the work force. And only five percent of these senior women are minorities. This at a time when there are nearly 60 million working women in America, more than 45 percent of the U.S. work force. Women and minorities are two-thirds of the population, two-thirds of consumers and 57 percent of the work force. Women constitute 35 percent of the world's labor force, and projections indicate that the number continues to rise. Glass Ceiling research reveals that women of all racial and ethnic groups are most likely to be employed in the service industries and in finance, real estate, wholesale and retail trade. Nearly 75 percent of employed women work in these industries. Women and minorities seem to have the greatest opportunity for advancement in industries where change like deregulation and restructuring is occurring such as telecommunications; fast growing industries such as business services; and those with female intensive work forces such as finance, real estate and human resources. Cracks are in the ceiling and women are moving up the corporate ladder. Progress has been made, but we still have a long way to go. Surveys show that between 1982 and 1992, the proportion of women holding the title of executive vice president rose from 4 to 9 percent. Those at the senior vice president level rose from 13 to 23 percent. And a recent study by Catalyst shows a growth of women on the boards of directors of the Fortune 500. Eighty-one percent or 404 companies - now have one or more female directors. But there are still only two women CEOs. Yet despite the steady increases, women still hold only 1 in 10 board seats. This progress does not necessarily mean that the earnings gap between female and male executives is disappearing. Surveys show women executives in 1992 earning an average of $187,000 and men earning an average of $289,000 - a difference of $102,000 in average annual compensation. US Census data reported the ratio of female to male earnings in management jobs ranged from a low of 50 percent in the banking industry to a high of 85 percent for human services managers. How do you read the "Mean Income Disparities" Table? This table shows the mean income of those executive, administrators, and managers who earned a bachelor's or master's degree for specified population, with the white non-Hispanic mean incomes, male and female, as the comparative. The mean income or average salary of the white non-Hispanic executive/ administrators/ managerial male population with a bachelor's degree was $47,181. The mean income of their female counterparts was $31,338. African American men with a bachelor's earned on average $15,180 less than the white non-Hispanic male population, and African American women on average earned $754 less than white non-Hispanic women. Numbers in parentheses should be subtracted from the first number in the column to determine the mean income for the specified population. Equal educational attainment does not guarantee fair compensation. Regardless of credentials and preparedness, the return on investment or income, continues unequal. All women have considerably lower mean incomes compared to their male counterparts, and most minority men earn less than non-Hispanic white men with the same education at the same occupational level. It is this wage discrimination or pay inequity that is an indicator of the existence of glass ceilings. Why does the disparity continue? It's not because women and minorities are not prepared. The number of women holding bachelor and post graduate degrees has steadily increased. And more and more postgraduate degrees are in the field of business management and law - the credentials that are now considered prerequisites for senior management positions. Despite identical education attainment, ambition, and commitment to career, men still progress faster than women. What's really going on here is more a matter of perception than statistical fact. The majority of CEOs who participated in a survey conducted for the Commission believed that women - white and non-white - no longer confront serious glass ceiling problems. In 1990, financial Women International surveyed male CEOs and female vice presidents on the existence of a glass ceiling. 73 percent of the male CEOs didn't think there was a ceiling; 71 percent of the women did. Surveys explode some other myths about women executives. They work long hours - 56 per week on average - the same as their male counterparts. Only 14 percent refused to relocate as compared to 20 percent of the male colleagues. And only a third of the women surveyed had ever taken a leave of absence and 82 percent of these were for maternity or other family reasons. Hispanic men have the highest workforce participation rate. Yet stereotypes and misperceptions about women and minorities malign and impede us from consideration for career opportunities. Statistics and anecdotal data do not confirm the perception, now gaining unwarranted credibility, that women and minorities have made wholesale gains in the workplace at the expense of white men. To the contrary. Research suggests that the underlying cause for the existence of the glass ceiling is the perception of many white males that they as a group are losing - losing competitive advantage, losing control, and losing opportunity as a direct consequence of inclusion of women and minorities. Societal barriers, which include a supply barrier related to educational opportunities and the level of job attainment. There is also a "difference" barrier manifested through conscious and unconscious stereotyping and bias. It translates into a syndrome that people who do the hiring feel most comfortable "hiring people who look like them." Stereotypes must be confronted with hard data because, if left unrefuted, they become factual in the popular mind and reinforce glass ceiling barriers. Governmental barriers include the collection and disaggregation of employment related data which make it difficult to ascertain the status of various groups at the managerial level. Also, there continues to be inadequate reporting and dissemination of information relevant to glass ceiling issues. Most important, there needs to be vigorous and consistent monitoring and enforcement of laws and policies already on the books. Internal structural barriers or business barriers include: Outreach and recruitment practices that do not reach or recruit women and minorities; Corporate climates that alienate and isolate; Pipeline barriers that restrict career growth because of poor training, inadequate mentoring, biased rating and testing systems; Few or no internal communication networks; Limited rotational job assignments that lead to the executive suite; And institutional rigidity that deny the fragile family and work balance. Without access to mentoring, developmental assignments, training, and other career enhancing activities in the managerial pipeline, too many qualified people are stopped short, before they fulfill the promise of their abilities. Corporate leaders must recognize that they need the talent and input of women and minority men at the highest levels to better address the changing consumer markets, the changing work force demographics, and international competition in today's global economy. By the year 2005, women and minorities are estimated to be 62 percent of the U.S. workforce. Breaking glass ceilings is an economic imperative. It is a bottom line issue for every business in America and internationally. And a pocketbook issue for working women and their families. Until the primary source of discussions, programs, and policies about glass ceilings, diversity and affirmative action focus on the business objectives of an organization - hence the need to be productive, profitable, competitive, and responsive to the changing demands of a global marketplace - the discourse will continue devisive and progress will remain painfully slow. "A Solid Investment: Making Full Use of the Nation's Human Capital" is the recommendation report that was presented to President Clinton and select committees of the Congress, and is designed to pick up the pace of change. The recommendations address ways in which business, government, and society at large can act to bring down the glass ceiling. They build upon strategies that companies and government are already using. 1) The CEO must communicate visible and continuing commitment to workforce diversity. This in turn can influence the culture of the organization by creating an atmosphere that fully utilizes the talents and capabilities of a diverse workforce . 2) Efforts to achieve workforce diversity should be an integral part of corporate strategic business plans. Competitive employers measure and monitor key business areas such as profits, capital investment, productivity, market share, and quality. Setting goals and timetables for work force diversity is an extension of this business practice which helps organizations measure their progress and growth. Additionally, line managers must be held accountable for progress toward breaking the glass ceiling. That may mean tying their pay and rewards system to accomplishments of diversity objectives. 3) Businesses should use affirmative action as a tool to help ensure that all qualified individuals have equal access and opportunity to compete based on ability and merit. Affirmative action is the deliberate undertaking of positive steps to design and implement procedures that ensures the employment system provides equal opportunity to all. Properly implemented, affirmative action does not mean quotas, allowing preferential treatment or employing or promoting unqualified people. It means opening the system and casting a wide net to recruit, train, and hire people who may not look like what corporate executives have traditionally looked like; who may not think like corporate executives have traditionally thought. It means promoting opportunities for advancement for people who can contribute effectively to a corporation and, consequently, the nation's economic stability. It means making full use of the rich talent this nation has to offer. 4) Business must expand their traditional executive recruitment networks and seek out candidates with non-customary backgrounds and experiences. They must go beyond the old school network and seek talent both inside and outside the corporation, by looking to employee sponsored networks and affinity groups, or at women's colleges, or universities with historical ties to ethnic groups. 5) Business must train the entire workforce in the strengths of ethnic, racial, and gender diversity. Educating your employees means creating a workplace that is welcoming and open to all. Diversity training debunks myths about the suitability and capability of women and minorities for executive careers. 6) Companies must act now to prime the pipeline by: identifying objective performance, skill and knowledge criteria for advancement; instituting formal succession planning; and providing rotational and non-traditional job assignments that broaden the base of a candidate's experience and visibility. Mentor and be mentored. Many successful business persons have identified mentoring as a critical factor in their career advancement due to its function as a means of networking, socializing and forming ties with influential corporate leaders. 7) Work/life and family friendly policies should be adopted. These include flexible hours, daycare and elder care programs, telecommuting, and job sharing. Family friendly policies improve productivity and reduce costs by relieving workers of non-job related worries and allows them to focus on business objectives. 8) Companies must implement high performance workplace practices that include employee participation, innovative compensation policies, employment security, information sharing, and continuous learning. There is strong evidence that doing right by employees is also good for the bottom line. Companies with well respected employee practices that invest in their workers see a positive impact on measures of long-term corporate performance such as utilization of capital and total returns to investors. One study found companies that introduced formal training programs experienced a 19 percent larger rise in productivity than firms which did not train their workers. Government has a role to play in breaking glass ceilings. Government must lead by example and make equal access and opportunity a reality for all. It can not mandate and require private sector to pursue and value diversity, if it is unwilling to do the same. Enforcement agencies must increase their efforts to enforce existing antidiscrimination laws, such as Equal Pay Act of 1963, ADA, and FAML, strengthen interagency coordination, and update regulations and policies to keep up with the changing workplace environment. Improved data collection can give a clearer picture of the progress women and minorities are making by pinpointing areas where improvement is needed, and increased disclosure of diversity data is an incentive to develop and maintain innovative, effective programs to break glass ceiling barriers, while beginning a process of positive social change through corporate employment policies. Doing right is consistent with doing well. Additionally, government - federal, state and local - must ensure adequate resources in funding and personnel, which are essential for enforcement agencies to fulfill their legislative mandates. Glass ceilings in the business world are not an isolated feature of corporate architecture; rather they are held in place by the attitudes of society at large. While the Commission recognized that attitudinal changes cannot be dictated, mandated, or legislated, it did put forward initiatives that address the difference barrier and can reduce stereotypical thinking, prejudice, and bias which can be absorbed and become the beliefs upon which we act. The media plays a critical role in developing and eliminating stereotypes and biases that affect the way minorities and women are viewed in society at large and in the workplace. The Commission recommends that media organizations examine closely their diversity demographics at all levels; review their coverage for accurate diversity portrayal and possible distortions; and establish an award for the media organizations that consistently puts forth accurate and positive reflections of women and minority groups. The education community can develop positive images of diversity through cultural awareness programs. Schools must open the dialogue on diversity. They should acquaint students to the wide array of career opportunities through school/business partnerships that provide better career counseling by bridging the gap between the world of work and the world of education. The education system and society must recognize the potential of non-traditional achievers by expanding traditional core competencies to include leadership, teamwork, and strong analytical, communication and interpersonal skills. Language is a key competitive tool, and multilingualism is necessary including a familiarity with the language of computers. "The language of international trade is not English ... it is the language of the customer" and the Commission recommends that students and those who wish to advance acquire proficiency in a second language. Building on the success Ms. Foundation's "Take Your Daughter To Work," the Commission recommends establishing "Take A Child To Work Day" that would allow American business to provide leadership and commitment to generations of youngsters searching for role models in the corporate world. It was the Commission's hope that businesses, organizations, and folks like yourselves, would take these recommendations, build upon them, and encourage their employees, clients, and vendors to work within their organization and communities to implement them. As people of all races and both genders enter the work force in increasing numbers, we will transform the character of corporate structures and that change is as inevitable as it is beneficial. It is my hope that business, government, and society at large, will fully utilize all the people, by creating a cohesive, inclusive society where ethnic and gender strengths are valued, and our differences contribute to the common good. 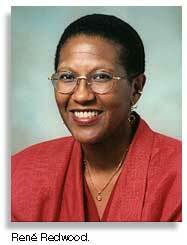 A great woman, educator, scholar, and leader, Barbara Jordan said, " What the people want is simple. They want an America as good as its promise." When glass ceilings are forever shattered, we will have succeeded in using our greatest asset - the people - to their fullest potential. And we will have come a long way to achieving the full promise of our society by making its bounty equally available to all. The Federal Glass Ceiling Commission was established by Title II of the Civil Rights Act of 1991. It was a 21-member bipartisan commission appointed by President Bush and congressional leaders with a legislative mandate to: conduct a study identifying the barriers that prevent, and the policies and programs that promote minorities and women upward in corporate America; present an annual Presidential award to a business who has made significant efforts to remove obstacles to career growth and has provided advancement opportunities to women and minorities; and educate the public on who is effected by and what can be done to remove glass ceiling barriers. The Commission completed its legislative mandate in November 1995 under the leadership of Robert Reich, Secretary of Labor, and was terminated by law. Copies of the Glass Ceiling Commission's fact-finding report, Good for Business: Making Full Use of the Nation's Human Capital, and the recommendations report, A Solid Investment: Making Full Use of the Nation's Human Capital are available on the World Wide Web at http://www.ilr.cornell.edu ; and the Government Printing Office (for a fee), at (202) 512-1800.